Somalis are extroverted, lively, alert cats that love to play, love attention, and thrive on human companionship. They are very curious, captivating, and expressive, with alluring personalities. Somalis are intelligent, learn quickly, remember remarkably well, and show a playful sense of humor. They are natural show-offs and born clowns. Somalis have a naturally happy disposition, desire the company of humans, and demand to be treated as one of the family. 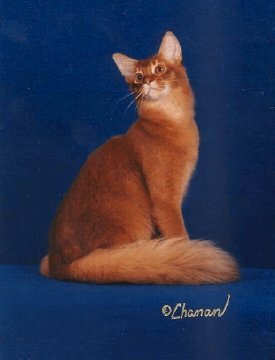 Tadofa Somalis began in 1989 when Bethany came across a photo of the most adorable kitten she had ever seen... a Somali kitten. She located a breeder in our area and went to "look." We had absolutely no intention of purchasing a cat, but Bethany walked out with two contracts in her hand for the most adorable kittens we had ever seen. After being owned by Tyke and Keldorran for about a year, we made the decision to start breeding Somalis. Some lines of Somalis and Abyssinians have genetic problems behind them, and having lost Tyke and Keldorran's older brother to one of these diseases just before we decided to start breeding, we made the conscious decision to locate and use only the healthiest lines available; lines free from these genetic diseases. Losing Tyke in February and then Keldy in July of 1999 to the same disease that took Ares reaffirmed our commitment to that decision. Tadofa Somalis (pronounced "tad-uhv-uh", as in "little bit of a") is a very small cattery, taking pride in the outgoing, sweet-natured personalities of our cats and kittens. Kittens are raised underfoot as an integral part of our family and are not caged to ensure they develop the proper socialization skills. This is a labor of love for Bethany, who can not imagine life without a Somali or two in it. We breed primarily for health and personality, doing very careful research on pedigrees and genetic health before any breeding takes place. Showhall wins are not nearly as important as a healthy, happy cat, but we have been very fortunate that our attention to health has also produced several International, National, and Regional winners and many Grand Champions and Grand Premiers. Most importantly, our kittens and cats are happy, loving companions. 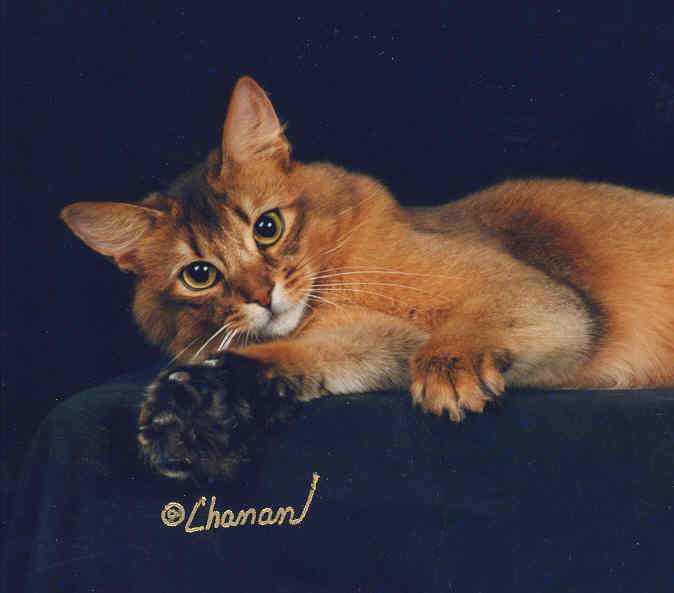 Tadofa Somalis are known as healthy, quality cats, with some of the best personalities around. Trustee, Somali Breeders and Fanciers Association, Inc.
Secretary, Somali Cat Club of America, Inc.
Midwest Regional Director and Charter Member, International Somali Cat Club, Inc.
Bethany also works with horses; riding, training, showing, and working with 4-H equestrian groups. She has been involved with horses since she was a youngster, and was a devout fanatic of the Appaloosa until she met Karen LeBlanc, Fifala Farms - home of Somali cats and Paso Fino horses. Karen became her mentor in the Somali world, and when Bethany went to Karen's farm for the first time, Karen quickly had a convert to the Paso Fino on her hands! Appaloosas remain one of her passions, however, and her Appy mare is currently leased out for a 4-H project. She also has a great love for Quarter Horses and American Paints, who are also a part of the home-life at Tadofa, and we are owned by several in addition to the Pasos and Appy. Bethany is EAGALA certified and uses the horses in her capacity as a consultant, providing experiential corporate training sessions to help employees learn team building, communication, and leadership skills. If you are interested in more information, please feel free to contact Bethany. She is also involved with an area equestrian 4-H group, Saddle Horse Council, and the Animals' Disaster Team. Article © 1993 by Bethany T. Tod, Tadofa Somalis. No part of this web page or our brochure may be reproduced without the prior written permission of the author and this copyright notice. This Web Site © Copyright 1997-2009 by Bethany T. Tod, Tadofa Somalis. All Rights Reserved. No duplication allowed without express written permission. Please see Copyright Information for further details.